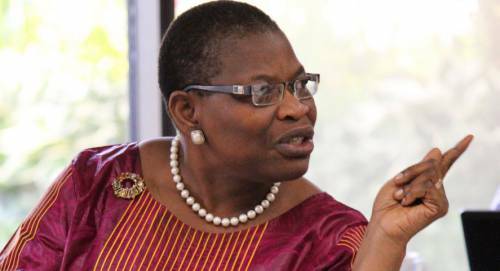 LATEST INFO :Buhari instructed the police IG to detain me -Oby Ezekwesili, – Royal Times of Nigeria. A former minister for education and co-leader of the #BringBackOurGirls (BBOG) movement, Oby Ezekwesili, tweeted today that some police officers deployed by the inspector-general of police have illegally detained her and arrested other members of the BBOG movement. Ezekwezili alleged that it was President Muhammadu Buhari who instructed the police IG to detain her and other members of the BBOG group. Her arrest is believed to be connected to the activities of the group. In a series of posts on her Twitter handle, @obyezeks, the former Minister of Education, said she was arrested alongside some members of the BBOG group. She said Aisha Yesufu, Maureen Kabrik, Jeff Okoroafor and four others were also arrested. it was also gathered that the police prevented members of the ‘Bring Back Our Girls’ group from marching to the Presidential Villa, Abuja. It was learnt that the BBOG members had gathered at the Unity Fountain, Maitama, and were about marching to the seat of power when armed policemen cordoned off the road and stopped the exercise. The incident led to a brief altercation between the policemen and the BBOG campaigners. Pinnick offers Oruma job in national team .